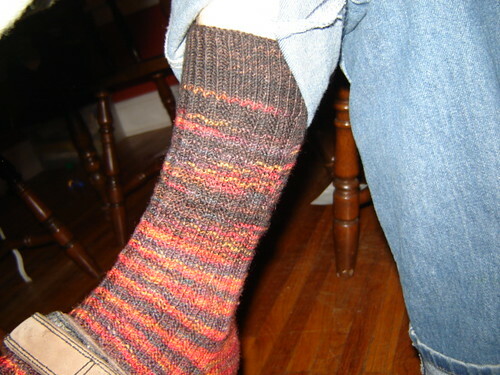 I’m always so revved up about Socktoberfest, but then I seem to lose my gusto and sort of forget about it after awhile. Not this year; I am determined!! 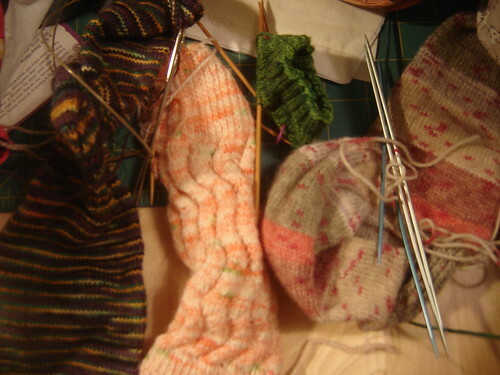 For such a long time it seemed that all I knit were socks. 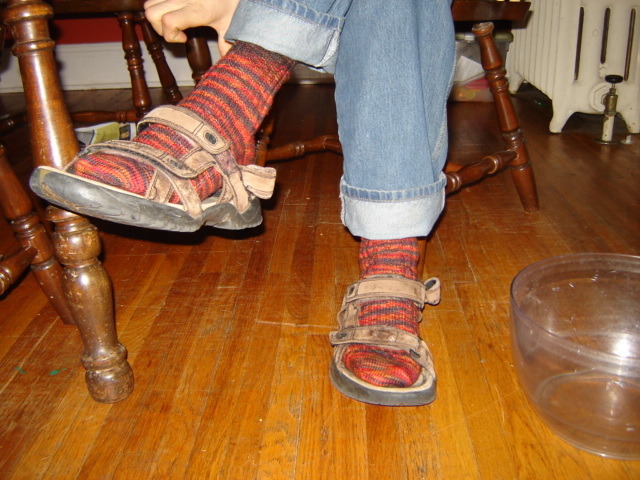 And not even exciting socks at that, just plain old stockinette in the round sort of stuff. But then I made a resolution to branch out and I did, which is a good thing but then something happened last Spring, something very bad. They started getting holes. Lots of holes. Bad enough that I’ve been walking around all day with my big toe sticking out of a lovely but very well work sock. And it’s supposed to snow this weekend. And we all know that I can’t just run out to Target, no, that’s not good enough anymore. Even the Smartwools from REI aren’t good enough for these tootsies. I need more socks. So I’m going to try it Yarn Harlot style, and see if I sneak in a row here and two rows there if maybe I can get two pairs finished up this month. Anyone care to guess how much I’ll actually get done? 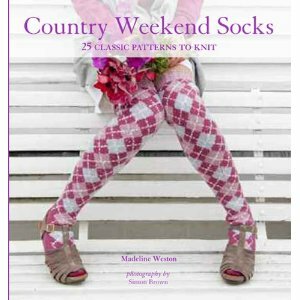 Feel free to queue them up for an easy summer sock project!! We celebrated Little Man’s last day of kindergarten tonight. I am absolutely floored that I now have a son who will be in first grade. Wow. My first baby is all, 100% boy. 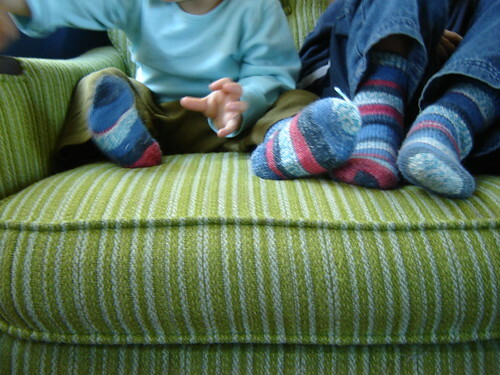 My second baby is working hard to be all boy, but luckily Knittykid’s got a lot of baby in him yet. Any my third, well…. let’s just say that despite the fact that Spinner thinks he’s a big boy like his brothers (climbing the stairs already and all that, yikes!) I’ve told him that under no circumstances may he get any bigger. Nope, not even a bit. We were sitting in Pizza Luce tonight, celebrating the beginning of summer. The Skeptic was talking about how he hopes that when the boys are all bigger, big enough that they don’t need anyone to cut up their pizza, or remind them to get out from under the table, or to take them to bathroom since it’s their first foray out in public without a diaper on (I decided today would be a milestone for Knittykid, too)…he hoped that even though it will be a lot of fun to be out for dinner with three teenage boys, we will remember how very, very sweet these times are. So anyway, you all can imagine my state right now. So here’s a picture I’ve been saving for a rainy day. I can save it because it is the sock that never ends. It stays the same no matter how long I knit it. 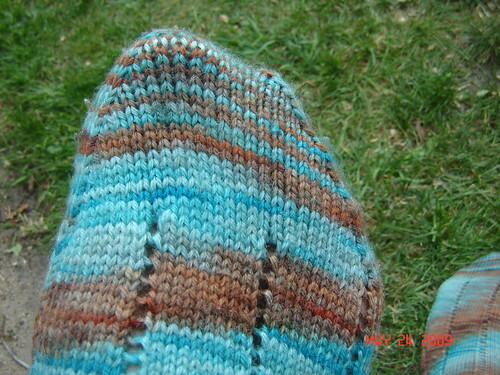 Spunky Eclectic, Blue Faced Leicester for her sock club. These will be lovely if they ever get done. This was her Halloween colorway. So soft. So what did I knit? 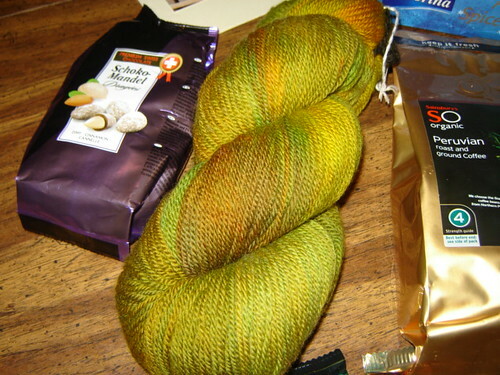 So first, you’re all wondering what skein did I order? 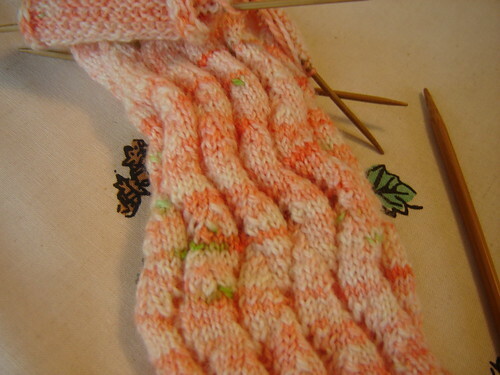 I’m taking my time, but right now I’m torn between Wollmeise (color!! yardage!!!) and Yarn Love (color! bamboo! silk!). Handmaiden had become my first choice, but my dear mom asked me to knit a hat for her, which means she’s buying. So I still get to knit up some beautiful Handmaiden Mini Maiden for my mom. (She picked out the Webs Tam). What did I knit to hit ten? Little Man requested “superhero” socks in the colors of red, white and blue. I had some Lion Brand Magic Stripes sitting around that was perfect for the job. Both boys are extremely pleased I’m finally done. 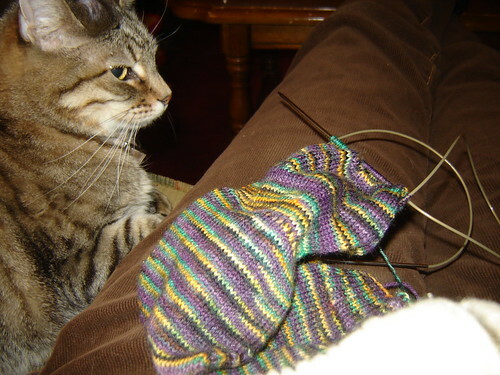 So am I, as I have to say Magic Stripes was not my favorite to knit with. There was just a feeling to the yarn that I didn’t like, too nylon-ish, maybe. 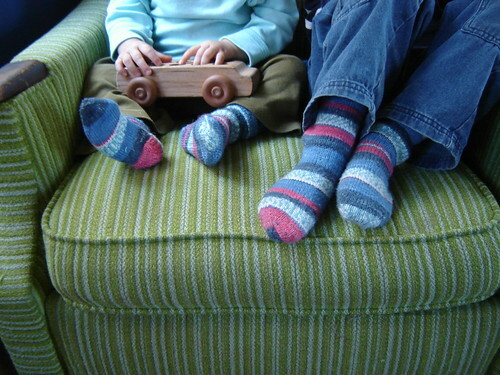 But it did the job, the socks are comfy and the boys are happy. Yes, that’s an end sticking out. Knittybaby doesn’t seem to mind. 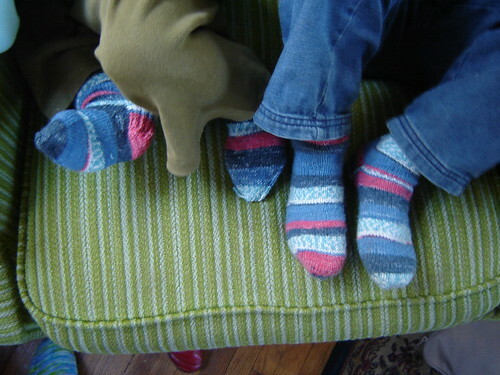 When asked, “Do you like your socks he says, “I do!” However, he also answers “I do” to every question asked these days, so who knows. He seems happy. 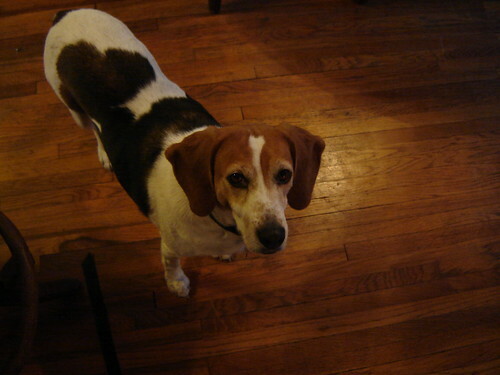 Just don’t tell Little Man I posted them on the blog. He informed me halfway through our photo shoot that these are “secret socks” and bailed as soon as he realized I planned to reveal them to the world. The yarn is Cherry Tree Hill Supersock (unknown colorway) and Lucy Neatby Celestial Merino for the cuffs and parts of the leg on one sock. It’s interesting, I started with two pretty evenly divided balls of the Cherry Tree Hill. 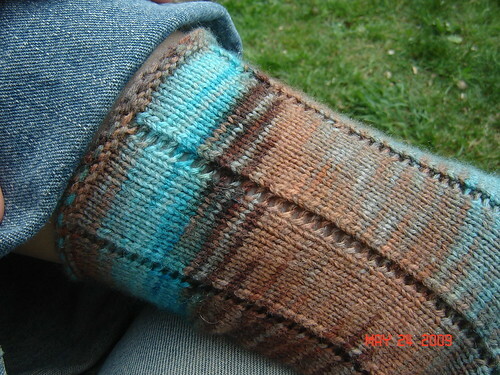 I knit the first sock with the smaller ball and added the brown cuff for a bit more length. 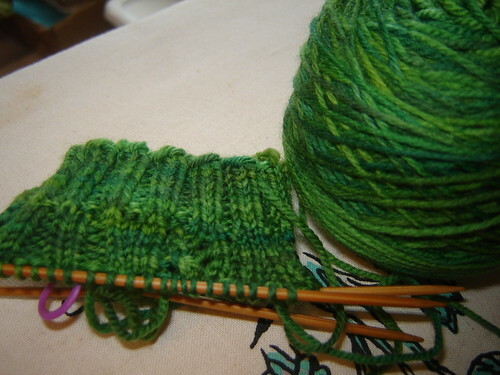 The second sock was knit with the bigger ball, and I was nearly out of yarn soon after turning the heel. I blended in the brown Lucy Neatby in with the Cherry Tree Hill, which worked out okay. But clearly one needs two skeins of Cherry Tree for a pair of man’s socks. And the Skeptic??? 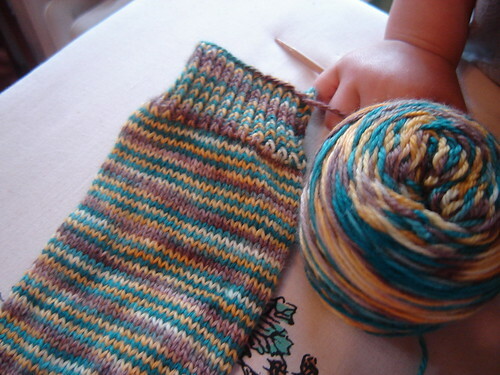 He is coming around to hand knit socks. 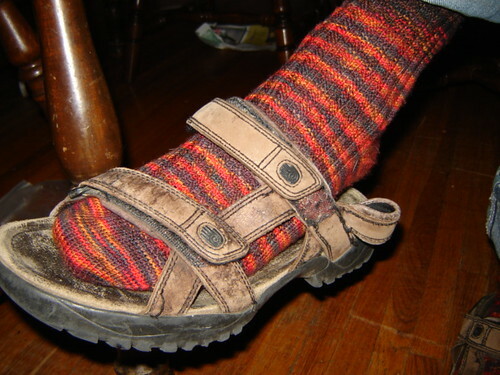 As for these, he says the fit is great and they are quite comfortable. The only problem? His feet got too hot. Now, it was only in the 50’s this weekend, so we’ll see now that it’s cooler out. But his next pair (yes, he loves them enough to get a second pair) will be in a cotton or bamboo blend. After the knitting, we have goodies!!!! 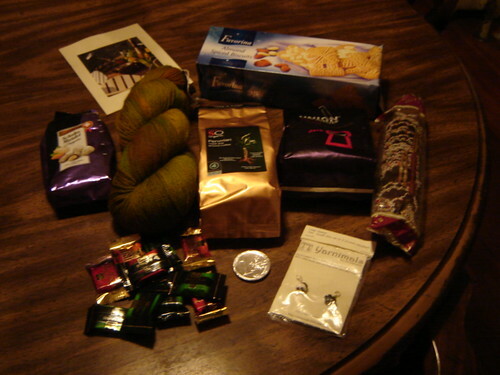 My Coffeeswap package arrived this week. I uncovered my batteries yesterday so I could finally take pictures. Look what Mrs. Pao sent!!! She sent Posh Yarn and it is just gorgeous. I am so in love with this yarn that I cast on for a tam already. The color is to die for. (I’m crazy for green lately). Thank you Mrs. Pao for such a wonderful package!!! I hope you love yours as much!!! This last picture is for my mom.